SMOK V8 Mini V2 S1 Coils Pack of 3 genuine replacement SMOK V8 Baby V2 S1 stainless steel single mesh coils 0.15 Ohm. Compatible with the following SMOK tanks: TFV8 Mini V2 TFV-Mini V2 Wattage range 40-80W (best 60-70W). 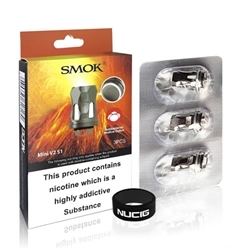 Buy NUCIG UK. Pack of 3 genuine replacement SMOK V8 Mini V2 S1 stainless steel single mesh coils 0.15 Ohm. Wattage range 40-80W (best 60-70W). �SMOK V8 Mini V2 S1 Coils Pack of 3 genuine replacement SMOK V8 Baby V2 S1 stainless steel single mesh coils 0.15 Ohm.